The development of an Enterprise Architecture is a complex and time consuming endeavor involving a multi-disciplined team of architects. Ultimately the architectures must deliver value to the business and this can only be achieved with the engagement of the stakeholders. Without a comprehensive stakeholder engagement and communication plan the architectures will inevitably fail to deliver the envisioned business benefit. The Enterprise Architecture should be a cohesive and well organized product that provides meaning for all stakeholders even though it comprises a number of interlocking and quite separately authored architectural contents. 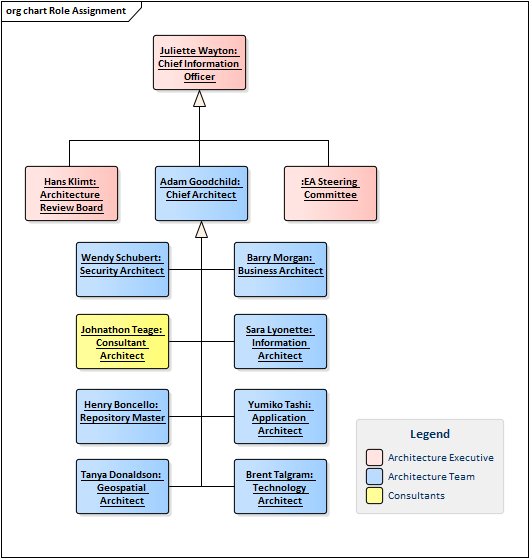 In this way the chief architect needs to act in an editorial role, ensuring that the Business, Information, Application, Technology, Security, Geospatial and Social architectures are merged into a coherent whole. The Architecture must act as a guide for the implementation teams, as source material for decision making and as a description of a system either before or after it is built. The Architecture Process must be well defined, repeatable and flexible to deal with the great variety of problems and opportunities that will be presented to the program. Fundamental to the execution of the process and the resulting architectures is the Architecture Team.